In Camera Lucida (1980, 26-27) Roland Barthes makes a distinction between different types of content of photographs, the studium and the punctum. The studium is that part or aspect of the photograph which refers to an existing body of information, a cultural artifact with which the viewer is expected to be familiar, and includes the ostensible reason why the photograph was taken. 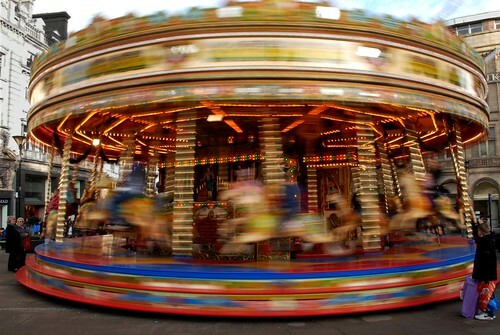 In the photograph above it would be the merry-go-round itself, and its speed and excitement, conveyed by the motion blur (the result of a long exposure deliberately chosen by the photographer). All this is coded and requires decoding by the viewer. The punctum is not coded. It’s something in the photograph which imposes itself on a particular viewer, grabs her or his attention, communicates directly. It might be the child on the right, apparently laden with shopping, staring at the merry-go-round as if he were envious of those enjoying a ride. The punctum can exist because the photograph is a special form of communication, unlike others. It tells the viewer that its subject did in fact exist and permits a direct, unmediated view of its subject – and it acquires this property from the way in which it is made: by the direct effect of the light reflected by the subject on the recording material (which for Barthes was film but is now more likely to be the sensor of a digital camera). ‘The photograph is literally an emanation of the referent’ (80). I read Barthes’ book, the last he wrote, only recently, although I should have read it earlier. It’s a charming and stimulating book which should be read by anyone interested in photography, but I don’t agree with it. I think the punctum is as much a construction as any intended message of a photograph or any other form of communication. And so when the viewer experiences the effect of the punctum, this is the result of the viewer participating in the production of the image and its effects: a reading, not a communing with the thing which is presumed to have existed at the moment the camera shutter opened and closed, but an action in the present. ‘One day I received from a photographer a picture of myself which I could not remember being taken… And yet, because it was a photograph I could not deny that I had been there (even if I did not know where). This distortion between certainty and oblivion gave me a kind of vertigo, something of a “detective” anguish (…); I went to the photographer’s show as to a police investigation, to learn at last what I no longer knew about myself’ (85, emphasis as in original). I shall have to return to Barthes and Camera Lucida later.